Having the opportunity for time away, time to experience someplace new, is something I love. 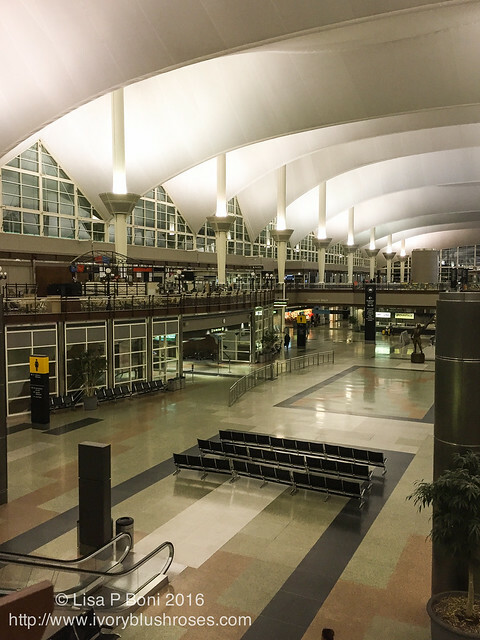 This last trip had an early morning start that involved arriving at DIA (Denver International Airport) quite early in the morning. Such a quiet open place in those early hours and so different from later in the day when the space is filled to the gills with people and sound. This trip took me to California, to an area where I had never been before! A longtime friend, whom I have known since Jr. High, picked me up at the airport and got me checked into my hotel, all before lunchtime. Then we headed off to Santa Cruz where we had lunch at a restaurant on the beach overlooking this scene! How amazing to have been able to visit the Atlantic Ocean in September and the Pacific Ocean in October! 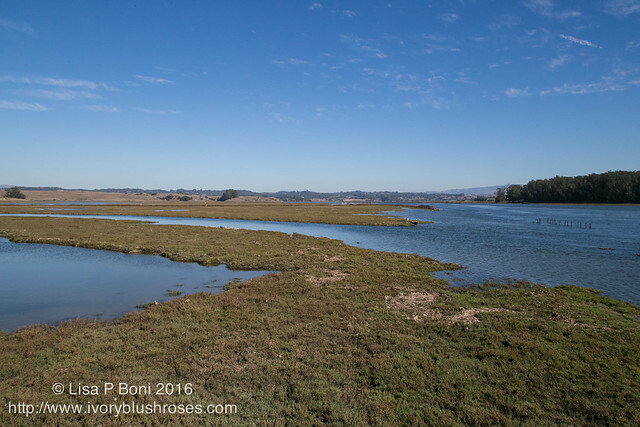 After lunch, we headed to Moss Landing, a wildlife area on a tidal river. Once upon a time, there were salt ponds here, but now the area is being slowly restored to it's natural habitat. 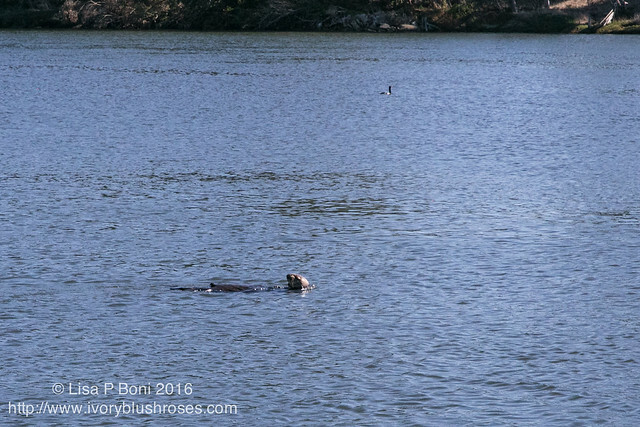 Our goal was to see some Sea Otters! I thought that we might be lucky to see one or two at most, but what surprised me was discovering that this area was full of them and we must have seen a dozen or more spread out evenly through the waters! So much fun to watch them dive down to find something to eat, then return to the surface on their back, munch away on their meal, then diving down again. I was expecting them to be about the size of river otters, but instead discovered that they weigh 40 - 70 pounds! Wow! What a fun afternoon watching them, the harbor seals, and an amazing array of birdlife! Too bad I didn't bring my binoculars! 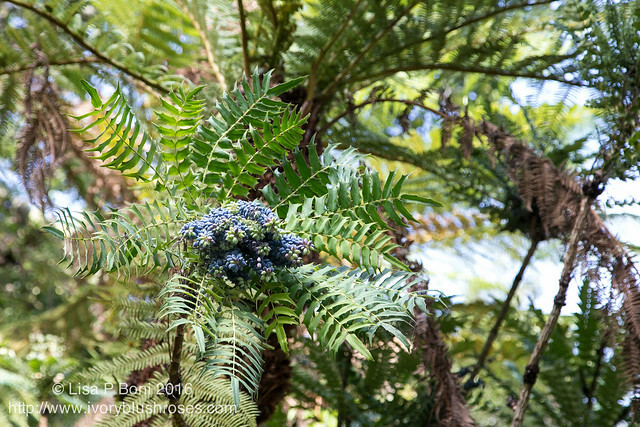 The next morning, my friend picked me up and we headed to San Francisco to Golden Gate Park. 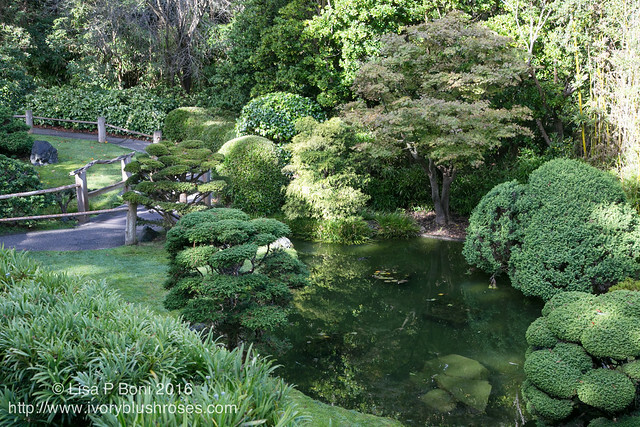 More than anything else, I've wanted to see the Japanese Garden there for years and years. Sometimes things that have been long anticipated turn out to be disappointing, but this was not one of those! 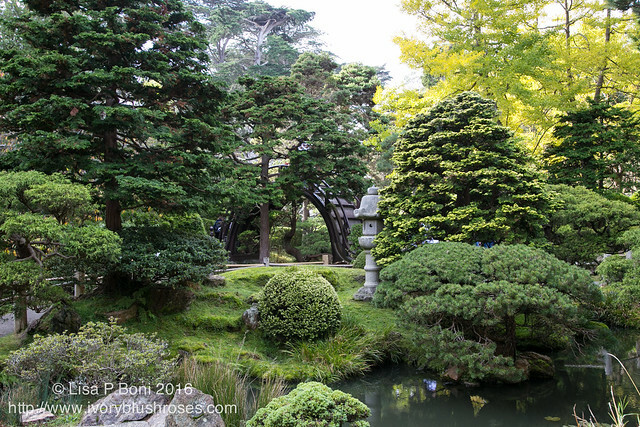 The garden was spectacular and truthfully, I would have been happy to spend the entire day there soaking in it's beauty! It was everything I had hoped for! No matter which direction one looked, there was a tranquil spot of beauty. 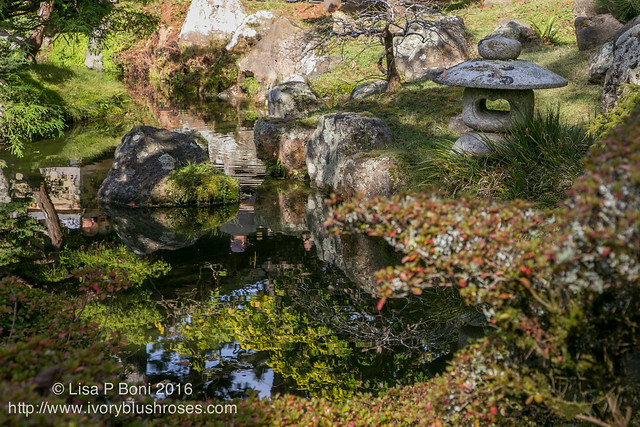 Little ponds and waterways with beautifully placed rocks, foliage and stone lanterns were everywhere. Over every small hill was a spectacular yet peaceful view. 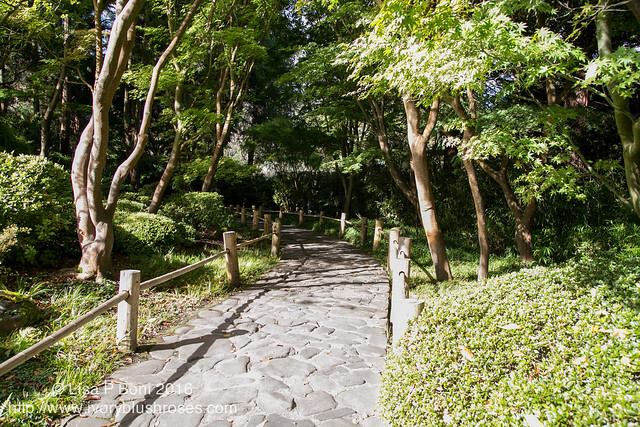 Every path led to a new vantage of serene beauty. 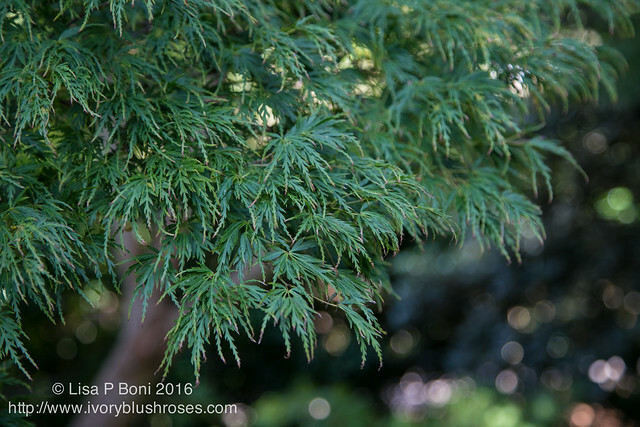 I loved the curtains of maple leaves of all varieties that shelter the wandering paths. And the differing shapes of leaves. 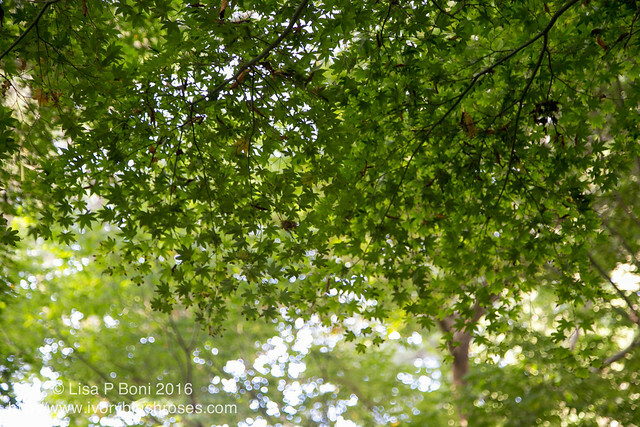 Who knew that maple trees came in such variety?! At every turn, a decision to make of which way to go ~ and each choice just as beautiful as the other. A lovely excuse to simply wander where one feet will go. 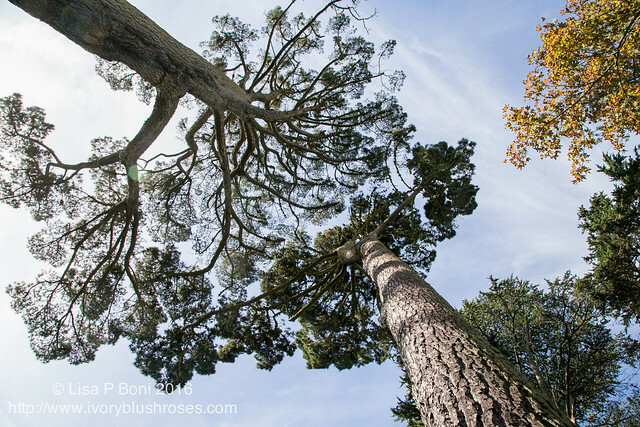 Beauty even in looking up to the towering trees above and seeing how they have grown together companionably, meshing with each other, adjusting and adapting and sharing space in a way that allows both to thrive. It seems to me that this a lesson that we humans still need to learn. 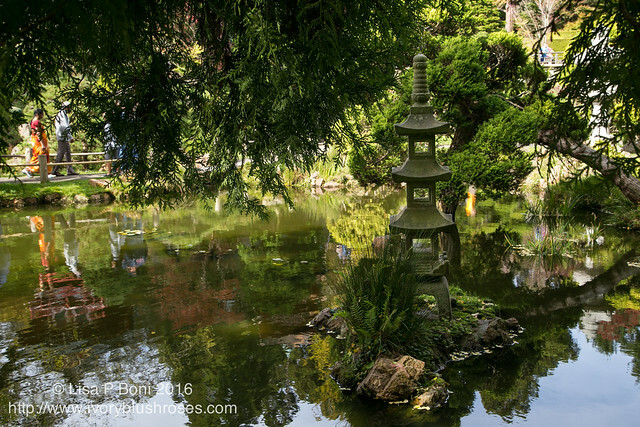 The serenity of the garden finds its foundation in the ponds and architecture throughout. 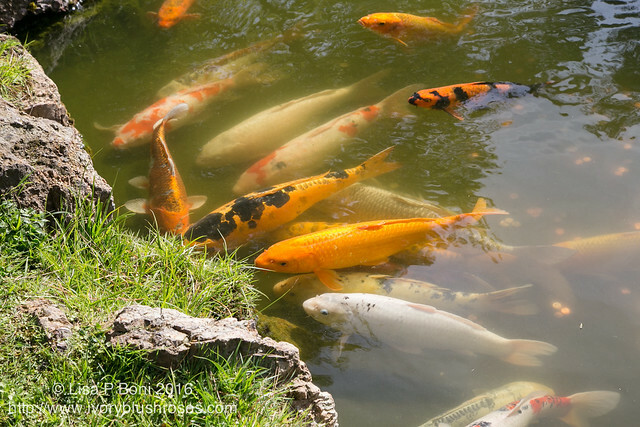 The large koi in the ponds appear to be thriving. 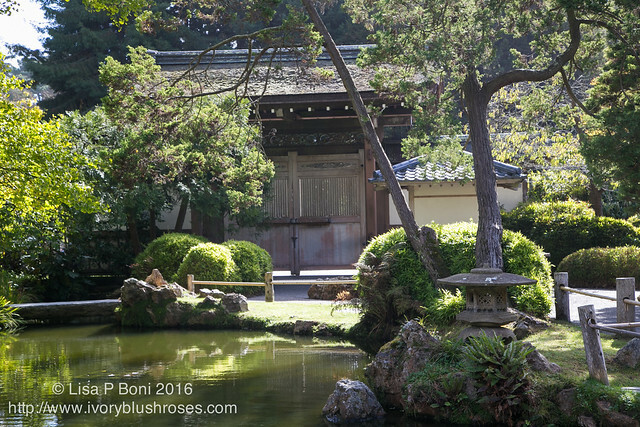 This beautiful garden had so many spots for quiet contemplation! And despite being filled with people, there were quiet moments and quiet places to be found all throughout. Just beautiful. A perfect morning, time spent with a good friend, and an exquisitely beautiful garden. My heart was full! 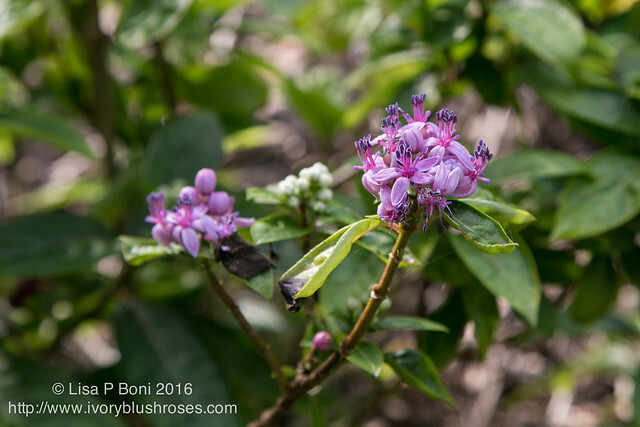 After our morning spent exploring the tea garden, we set off across the park to the Conservatory of Flowers via the many paths through the woods. 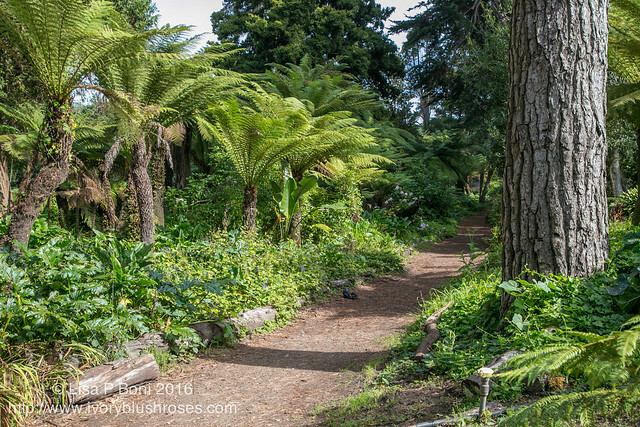 I loved this path of tree ferns! So many things I had not seen before! 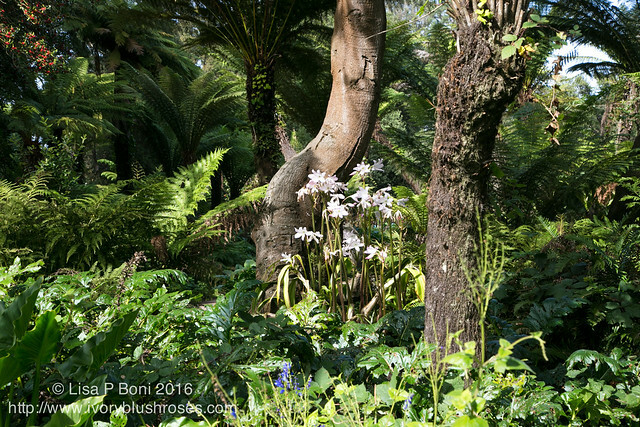 A patch of Resurrection Lilies bursting forth in a glorious display under the shady canopy of trees! 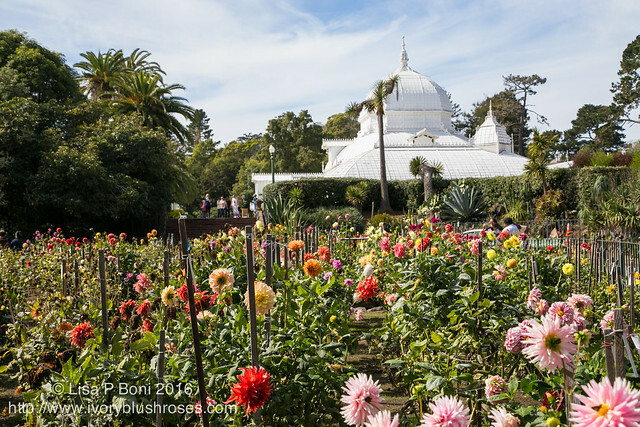 At the Conservatory of Flowers, we encountered the Dahlia garden and it's symphony of color! 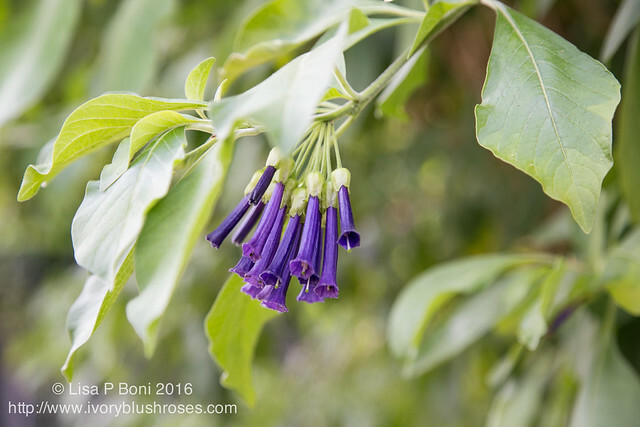 Lovely lilac blossoms and buds of some exotic plant ~ just beautiful! 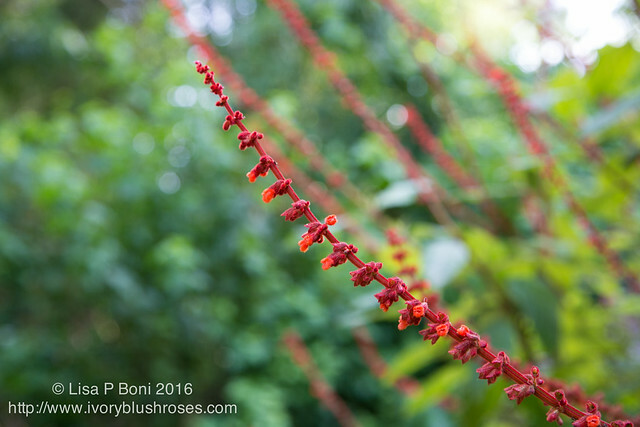 Loved these striking scarlet branches and blossoms against the green foliage! Just a delightful day of wandering and exploring! 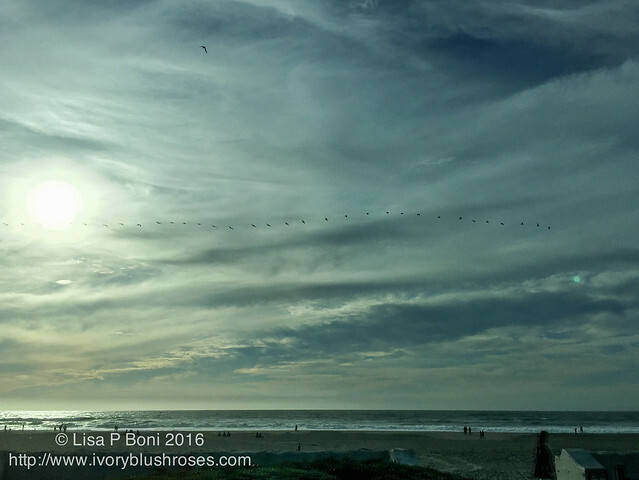 Our day ended with a drive along the shore and the sight of a string of pelicans flying in a wavy line along the shore from north to south, almost as far as the eye could see! The enormous waves crashing ashore were something to see! 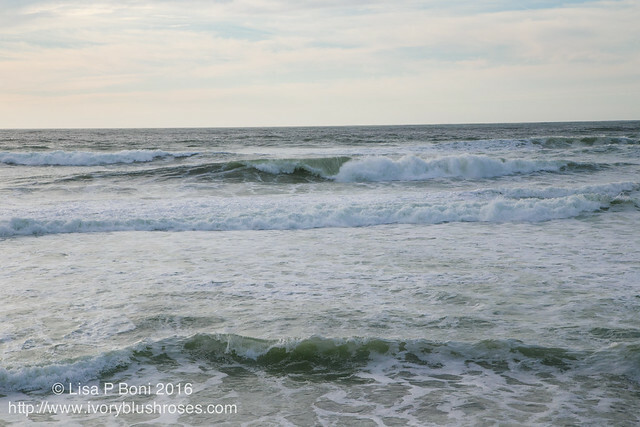 I thought that the surf I'd seen on Cape Cod during storm Hermine had been amazing (and it truly was! ), but those waves would have been dwarfed by these enormous beauties that spread up and down the coast at high tide! Just a lovely day! So pretty Lisa! So many beautiful views. Love the photo looking up at the pine trees. Two beautifully written and photographed posts. The area is truly lovely, is't it? I am a native Californian and lived in Santa Clara for twenty years in the 70's and 80's prior to moving to the country in the foothills of Sierra-Nevada. It is so wonderful visiting again all the sights I enjoyed during those years. The yearly quilt show was always spectacular, even back then. I remember the first show at that location. Thanks for sharing all the loveliness that you so beautifully presented for us to enjoy. God Bless. Such beautiful photos, as always. I was really struck by the one of the tree canopies looking up. 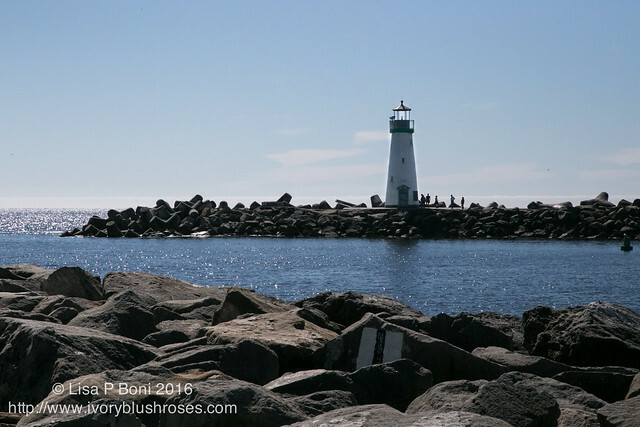 I live in Santa Cruz and have been a bay area resident for 40 years. Still Loved seeing it thru your eyes. 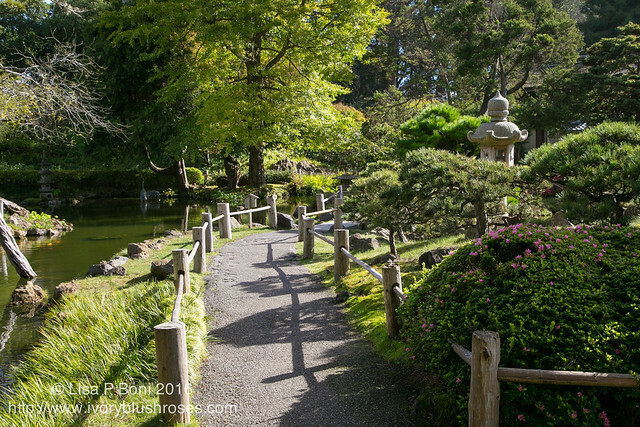 That is one beautiful Japanese garden! I loved it all and can only imagine what it must have been like to be there in person. 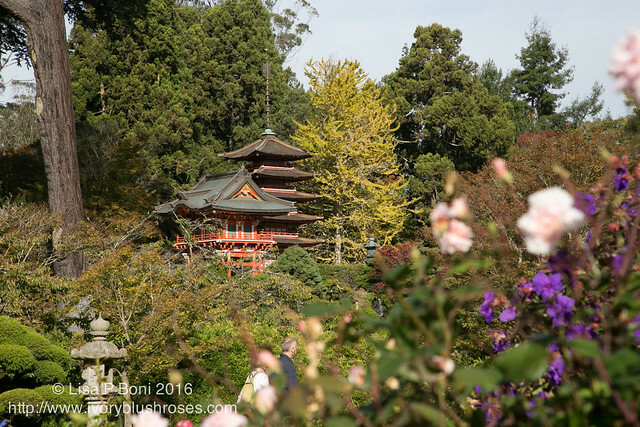 The Japanese Tea Garden in SF is a jewel. So peaceful every time I visit. Your reminder of Elijah's words are so pertinent. 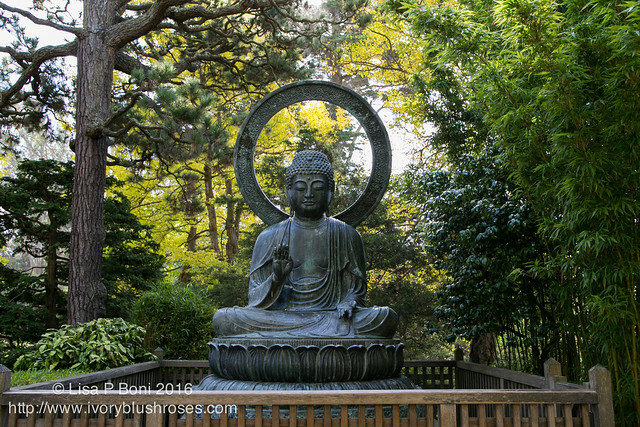 Peace and calm in a troubled, noisy world.